Is it possible to output the sound from my electric violin to a Bluetooth speaker? I'm hoping someone here will be able to answer my question. I have a Yamaha SV-150. I currently use the earphones that were supplied with the instrument, but on rare occasions (i.e. when the neighbours are out) I would like to be able to output the sound wirelessly to by Bluetooth speakers - does anyone know if this is possible? And if so, what equipment I would need? I was thinking of doing that also, but after some very good (expert in the field) advice I decided not to and go with hard-wire instead. The reason is because of latency issues. The signal isn't very clear in frequency response until you get up into the thousand dollar range, same applies to wireless headphones. Wireless is more complex than plugging in headphones or a patch cord. More that can go wrong, and trickier to get right in the first place. For just occassional use, it may not be worth the bother or expense. I mean, if all you want is to hear your violin through your Bluetooth speakers, then you could plug a simple patch cord between the violin and a Bluetooth device like your computer, I think? I don't know a lot about Bluetooth, to be honest. I do sometimes run my electric violin wireless, so I don't have a cable hanging off the instrument to stumble over (I'm a bit of a klutz) or drag around (I like to move around when I play). Wireless isn't that unusual in live music. A lot of guitarists and singers use it, and there are systems made by reasonable brand companies that don't cost much for entry level systems. You can get a simple Nady wireless rig made for electric guitar off Amazon foir as little as about 50 bucks. But it is made to plug into the 1/4 inch jacks of an electric guitar and amp, and I'm not sure if your violin is made to be able to plug directly into a guitar amp. It wouldn't be Bluetooth capable in any case. You *might* be able to use something like this.. But I have no experience at all with Bluetooth type devices or your particular violin, so figuring out if it would work for you is up to you. @cdennyb: I had to do a double-take where you said "latency". I've never run into noticeable latency with wireless systems. Maybe with some of the newer digital ones, it may be an issue for all I know. There is, however the lag that comes into play from playing a distance from the amp. The signal can get to the amp almost instantly, but sound takes time to travel through air. Sound travels approx 1,126 ft per second, so very roughly speaking, every foot you are away from your speakers there will be about a millisecond of delay. I know you use fx enough to know that 20 ms (for example) is a noticeable amount of delay, and could possibly throw off some players' timing. Same thing happens with being far away from the amp with a long patch cord, though. But in any case, it is inevitably more batteries and more connections and settings to have to mess with, compared with sticking with wired systems. And yes, frequency response will usually be a trade-off, compared with wired systems. Thank-you for your help. It is appreciated. I guess I'll need to do a little more investigating. I just didn't want to spend money on equipment that I don't really need. I have some UE Boom Bluetooth Wireless speakers already and I wanted to output to them, but it's sounding like it won't be that easy. I bought one of these little FM frequency transmitter units and thought I'd give it a try. It was totally disappointing. Not only did it not have a range of over 10ft, the quality was total crap. It had humm, distortion, etc. and is finding it's way to the garbage can shortly! No matter what frequency I used, no matter how good the antenna was, nothing helped. It's a waste of money for one of these little toys. If you were to have to spend any money at all (and I assume you would) - why not consider a set of (really cheap) active speakers ? [ cabled, not bluetooth ]. These ones here ( in UK ) cost £10 ( circa 16 bucks ). 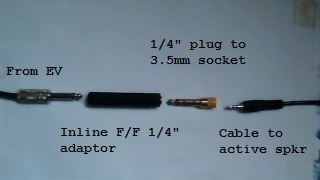 And these two connectors should only be a couple of dollars - it could well be a practical alternative to messing with radio and / or bluetooth for the occasional use. EDIT: Notice - the EV plug is mono - everything else is stereo. Worry not about that, it works just fine and you'll hear an identical sound image on the L and R speakers.